Golden Gate Cottage --Our Own Private Beach! BOOKING NOW FOR SUMMER WEEKS 2019!!! BETWEEN MEMORIAL DAY and LABOR DAY weekends, I book only by the week. Our SUMMER WEEKS go from FRI. 4pm to FRI. 10 am. THE Rest of the YEAR is a 2 night minimum. Golden Gate Cottage sits right on Lake Erie just a few feet from the water, with a view of the water from every room in the house. It is surrounded by a beautiful lawn and grounds with plenty of privacy and its own sandy beach. Especially in the summer Golden Gate is great for families with our beach right next to the house, the playground across the street, the hot tub on the patio and the pool table in the garage! But, off-season---it it a fabulous place for 'Girlfriend Getaways'! I have put luxury linens on the beds, soft, wonderful towels and there are three king bedrooms, one queen and one double and a pullout in the living area. We take great pride in keeping Golden Gate immaculately clean and in good repair. We are not an inpersonal management company but are very hands-on owners who want your stay with us to be full of blessings. Golden Gate is quaintly furnished with antiques, leather furniture and my own special collections. At the front of the house is a large patio with furniture facing the lake. Inside, a sunroom across the front of the house gives spectacular views,it has a large dining table in it so you can enjoy the lake whatever the weather is,whenever you eat. We like the kitchen to be fully equipped for any occasion and enjoy gazing at the water as we cook! We are continually updating and adding to Golden Gate. This past year we added a second floor lakefront balcony and some new windows to enhance Golden Gate's fabulous view. This year we have just completed a new kitchen!! We have future plans for Golden Gate, but we also like to keep the essence of it the same---so that if you come back year after year, it feels familiar and comfortable. Like 'Grandma's house' (on the lake)! It is our privilege to own this cottage and share it with you! Many guests have spent hours on the beach during the day and then enjoyed a bonfire at night. Golden Gate is the kind of place that you can spend your whole vacation in just relaxing and 'vegging out' as we do or you can easily find fun and exciting things to do within a 30 min. drive. Cedar Point amusement park, the ferries to Put-in-Bay and Kelley's island, Lakeside---Lake Erie's Chautauqua and the Marblehead lighthouse are close by. For those of you into nature and birding, our area was part of the 'Great Black Swamp' and we are at the crossroads of two major migratory paths. The variety of birds and waterfowl is wonderful to see! Magee Marsh with it's nature programs and boardwalks etc. through the marshes is close by. We enjoy putting you in touch with what's available in our area and helping you have the best possible time at Golden Gate! Cancellation policy is discussed with owner when you book. I am semi-retired, and my husband and I love to spend time on Lake Erie in the summer with our family and friends. I fell in love with Golden Gate Cottage the first time I saw it! It is in my mind, a 'Grandma' cottage. Sweet bungalow style, wood floors, very cottagey, and the views of Lake Erie are awesome! We love this location, because it is quiet, lots of birds, and yet it is close to the Lake Erie islands, Port Clinton and Lakeside, and Cedar Point! Hanging out by the lake on the patio; reading and cooking! Beautiful cottage! Super clean! Perfect getaway for all 10 of us. 10 of us rented the cottage for the weekend (ranging from 65 to 15 years of age). We all had a wonderful time. We could have easily stayed a week and still had plenty to do. The cottage was very clean and had everything we could possible need! Fully stocked kitchen, magazines, books and board games also provided. It is right on the lake so the view was amazing! Renting the cottage was very easy. Marla made the process go extremely smoothly. This cottage is perfect for as little as 2 and as many as to 12 people. Location is just 15 minutes from Port Clinton. Will definitely be back!! I highly recommend staying here!! We cannot say enough about the Golden Gate Cottage and the courtesy extended to us by Marla Rickloff. 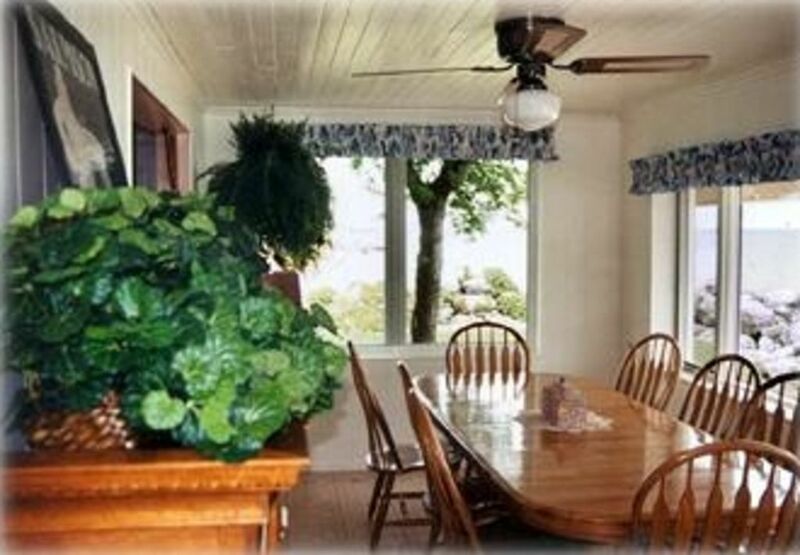 The Cottage is located right on Lake Erie, with the lake wall not more than 15 feet from the house. Even though it was cold outside, the inside is charming, clean, comfortable, and the rooms are spacious. We hosted our extended families and everyone loved the house. There is plenty to do around Oak Harbor and is a short drive to Lakeside, OH and other interesting sites for side trips. We will do this again in the near future. Marla is very accommodating and easy to work with. We highly recommend this vacation getaway! My husband and I just spent a week at Golden Gate with our three grown daughters and their families. It was the perfect place for all of us! The little ones had lots of space to play with their toys, and their parents really enjoyed the game room and hot tub. The patio near the water is a wonderful space to relax and see some beautiful sunsets. Having a beach all to yourselves is pretty great, too! The kitchen and bathrooms are very well stocked....no need to bring towels or bed linens, either. Pretty much all we had to bring was our clothes, food, and toys for the kids. We're all looking forward to visiting Golden Gate again! We were celebrating my husband's 60th birthday so we wanted a place large enough for our whole family to come and go. We had children and grandchildren join us at different times during the week. The house was large and comfortable with all of the amenities needed. The kitchen was upgraded and wonderful for cooking for large family meals. I especially loved the view of the lake even as I cooked dinner! We ate all of our meals in because of the wonderful view and the large kitchen. The beds were comfortable and linens were high quality. It was especially wonderful to have 2 sets of washer/dryers due to the large volume of towels a large group uses. We enjoyed the private beach area and had bonfires on the beach a few nights. We loved being right on Lake Erie and would certainly rent Golden Gate Cottage again! My husband and I recently rented this property for a week. We live in the Toledo area which made it easy for family and friends to join us at various times during the week. It was extremely clean and spacious! Room for everyone..! We had some rain while we were there, but no fear...with the glassed in front patio we continued to enjoy the magnificent views! We had a bit of a nor'easter one night and the crashing waves were awesome! Kitchen-fabulous...and I love to cook! Beds were clean, clean and very comfy...! There was plenty to do with the game room, beach and hot tub! Thanks Marla, our family and friends had a great time and new memories! Cedar Point, Lakeside (The Chautauqua of Lake Erie), ferry to Put-in-Bay, Marblehead lighthouse, and tons of fishing charters!